What you buy from the grocery store makes a big difference in your health, your weight, how you feel, and how you look. Food and drink has the power to either improve or destroy your health. But how can you tell what’s actually good for you in a grocery store full of thousands of options, and when most products are hidden in bright colored boxes plastered with marketing slogans? As soon as you walk into the supermarket, your senses are immediately bombarded with bright colors and pleasant aromas as you’re greeted by fresh fruit, vegetables, flowers, and special products featured on display. The vibrant colors put you in a good mood and make you want to spend money. You then smell freshly baked bread which instantly spikes your appetite and makes you very hungry. If you happen to hear music in the background, the tempo of the music is usually slow because listening to a slow beat subconsciously makes you walk to that beat so you end up spending more time walking around the store. Before you even start filling up your big shopping cart, you’ve been brainwashed to spend money on things you don’t really need. Typically, we don’t look above and below the middle shelves in order to find alternatives that are store brands, bargains, or healthier options, and we simply don’t spend enough time walking along the perimeter of the store where the non-processed foods are often found. Time and time again, we fall victim to the common supermarket shopping pitfalls such as succumbing to impulse buys featured front and center on display, and stocking up on sale products just because they seem like a bargain. If you know how to navigate the labyrinth of the supermarket wisely, you’ll leave with shopping bags full of foods and drinks that will make you look and feel more youthful, invigorated, stronger, happier, and positive. So what can you do to avoid the common pitfalls of food shopping? Here are 4 ways to save time and money on your next trip to the grocery store. Look for cheaper alternatives above and below eye level on the shelves like store brand equivalents. 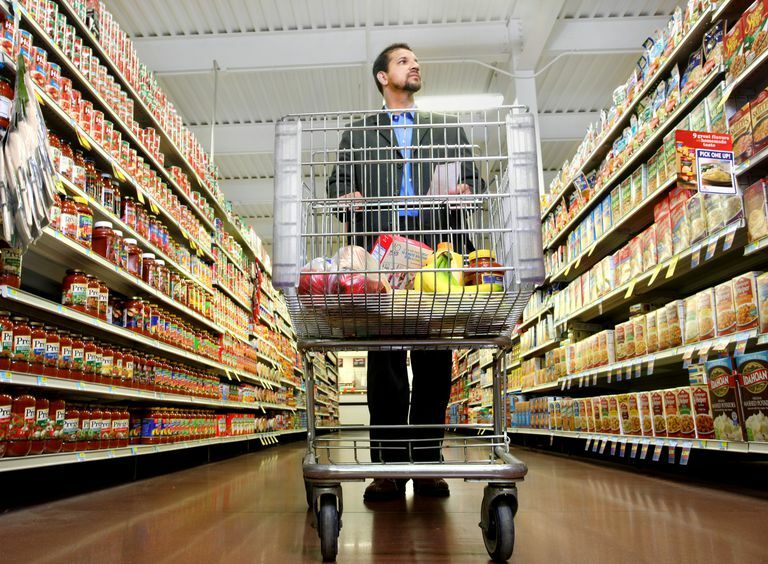 Supermarkets are laid out in a specific way to keep you moving through the aisles and spending your money. Store officials spend a lot of time, effort, and money coming up with ways to make more money off of you. Many of the large supermarket chains use computer programs to track return on investments on their products. This helps them decide exactly where to place a particular item on the shelves in order for it to sell more. Researchers have developed the perfect shelving specifications for placement, size, height, and depth to direct you to the products that supermarkets want you to buy. Usually, this means up-selling you so you buy more expensive items. Even though stores stock cheaper options like store brands, the supermarkets ultimately want you to choose the premium brands and products because they cost more. Prime real estate for items in the supermarket is the middle shelving in the aisles, sitting at eye level and just below. Manufacturers pay more to have products placed here. These shelves house the most expensive products because they’re the easiest for you to see and grab. If you’re looking for cheaper alternatives, you’ll have to look above and below this bullseye zone, standing on your tip toes to reach the top shelf, or crouching down to the floor to search for your bargain items. Store brands, generic brands, and bulk items are typically located on the bottom shelf. Since smart shoppers will search for the deals, supermarkets have no need to waste their prime shelving space on bargain products. Local, gourmet, and smaller brands are typically located on the top shelf. Another prime real estate region is end-cap shelving on the aisles. End-cap product placement comes at a premium price to the manufacturers, just like middle shelving placement. Prices for the same name-brand items can vary greatly between different stores. If you're looking to save money, shop at the stores that offer the greatest discounts. On your next grocery store trip, walk along the perimeter of the store to find fresh and healthy options.This is where the fresh and frozen items are located and you can make healthy shopping choices, including fresh fruits and vegetables, fish, meats, dairy, and frozen foods. One of the easiest ways to avoid buying processed foods is just to follow the perimeter of the store to do all of your shopping. Since foods in the aisles are mostly processed, it’s a good idea to avoid rummaging through the store so you don’t get any impulse ideas along the lines of filling up your cart with processed foods, loaded with preservatives and unhealthy ingredients. If you don’t show up to the supermarket with a plan, your purchases will be easily influenced by the marketing and advertising traps laid out for you in the store. Make a shopping list of what you need. A few ingredients to avoid or keep to a bare minimum are saturated fats, trans fats, cholesterol, sodium, sugars, and sweeteners. It’s also important to avoid shopping when you’re hungry because your heightened appetite causes you to buy unnecessary and unhealthy items you wouldn’t typically buy. Since vibrant colors like red and yellow are known to heighten appetite, they can entice you to buy certain foods that you would have passed on otherwise, especially if you’re shopping while hungry. Don't let words, pictures, or colors on the packaging sway your decision-making abilities. Stick to your shopping list. The ingredients list of every product should be placed front and center in big lettering on all packaging. Don't be fooled by product packaging—always read the ingredients list on products before buying. You’ll be surprised by how many products have unhealthy ingredients, like enriched bleached flour or sugar, as one of the first few ingredients listed. Beware of products that have ingredients lists rivaling the length of War and Peace. Pick items with the fewest ingredients necessary. Avoid dangerous fillers in your food like preservatives and items in the ingredients list that you’re unfamiliar with or can't pronounce. Labels like “low-fat” and “low-sugar” are highly misleading. If you remove one ingredient like fat or sugar, you have to replace it with another ingredient to try and achieve the similar taste and texture to the original food. Low-fat/non-fat items often have more added sugar in them, and low-sugar/no-sugar-added items can have more added fat or have added fake sweeteners. Only you and your doctor can decide what type of diet is best for you, but it’s 100 percent up to you to make sure that your supermarket shopping experience is a healthy one by understanding the psychology of the supermarket so you don’t fall victim to the typical traps that consumers fall for. We’ve all heard the saying “you are what you eat” so make sure to only bring home foods which will improve your overall health and well-being. Consumer Reports website. 5 Food-Label Claims That Can Fool You. Published September 2, 2014. Accessed April 30, 2016. Day S. Main Street America website. Improving Sales in Small Grocery Stores: How to Sell More Through Product Placement. Published October 1, 2010. Accessed April 30, 2016. Kendall G. Phys.org. The Science That Makes Us Spend More in Supermarkets and Feel Good While We Do It. Published March 4, 2014. Accessed April 30, 2016. NIH: National Heart, Lung and Blood Institute website. Tipsheet: Healthy Eating Starts with Healthy Food Shopping. Accessed April 30, 2016. Notre Dame College Online website. The Psychology Behind a Grocery Store’s Layout. Published January 4, 2013. Accessed April 30, 2016.